Pumpkin pie is usually too firm for my liking, so I add whipped egg whites to lighten it. Use a deep dish pie pan because the beaten egg whites add so much volume to the pie. Cut in shortening until pieces are the size of peas. Sprinkle water 1 tablespoon at a time, tossing mixture after each addition. Do not overwork dough or it will be tough. Form into ball and refrigerate 1/2 hour. Fatten dough on lightly floured surface. Roll 1/8” thick from center to edge. 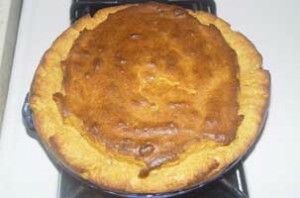 Place in deep dish pie pan. Prick crust with fork to let out steam while cooking. Place in 400° oven for 12 minutes. Let cool and add filling. Beat 4 cold egg whites to soft peaks in a cold bowl and gently folded into pumpkin mixture. Do not completely fold in meringue. Pour into prepared deep dish pie crust and bake for 1 1/2 hours or until toothpick inserted into center of pie comes out clean. Cool on wire rack. Serve with fresh whipped cream. Mmmm, good.